We know that sedentary behavior is a big contributor to the childhood obesity epidemic in America. And the fact that few children walk to school anymore — only 13 percent in 2009 compared to more than 50 percent in their parents’ generation — is part of the problem. This has a lot to do with how we’ve prioritized the movement of cars over the safety and comfort of walking. One aspect of this is school design. Thanks to research like the Safe Routes to School “Why Johnny Can’t Walk to School” report, we know it can be a problem when schools are built like big box stores, on cheap land that is outside of walking range for most students. Some folks in Seattle have been giving some pretty serious thought to how improved school design can better encourage active commuting. 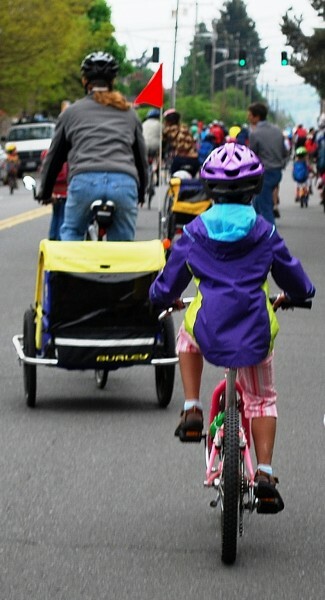 Julie Salathe at Cascade Bicycle Club reports on what a city traffic safety committee is considering to get kids moving again. Should the driveway to a school parking lot cross the main sidewalk where pedestrians and bicyclists are entering the school? Is a separated bicycle lane or greenway possible leading up to a school? What elements make for a safe and welcoming school entrance? These are some of the difficult questions that the City of Seattle School Traffic Safety Committee discussed on Tuesday in a meeting with architects, school principals and construction managers involved in the construction and planning of three new schools as part of the BEX levy. What may look like a great design to the architects and landscape designers — taking into account all of the site restrictions and neighborhood codes — may still fall short when looked at through the lens of bike and pedestrian access. So after the architects had presented their ideas, community representatives and bike/ped experts were encouraged to provide their comments in the hopes of building schools that are safe and convenient for all modes of transportation. Elsewhere on the Network today: Transport Providence offers an example of city leaders’ comical but sad sense of pride in the abundance of downtown parking. Bike Portland shares a study examining how the language used to describe cyclists can influence public opinion and political outcomes. And New Jersey Future discusses some of the Garden State’s new policy innovations to encourage smart growth.